All upholstered items need regular and properly done cleaning to be in hygienic and spotless condition. We offer excellent sanitising of curtains, mattresses, couches, sofas and upholstered items. Our cleaning technicians are trained to provide suitable cleaning of leather, velvet, wool and many other upholstery fabrics. They apply the most suitable approach and cleaning machines which guarantee effective work and no damage left on the upholstery. 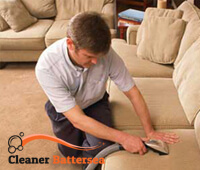 We offer professional upholstery cleaning to the Battersea residents which is inexpensive and reliable. If you let us provide the upholstery cleaning which you need, your soft furnishings will be in flawless condition and last much longer. Our cleaners know how to remove blemishes and odours of every nature without damaging the fabric of the upholstery. They use specialized dry and steam cleaning machines, stain removers and solvents that are very effective and non-toxic. Let us provide your upholstery cleaning which is available in SW11 and your curtains, sofas, mattresses and couches will be as clean as brand new. Our call centre works seven days in the week and is ready to assist you schedule your cleaning or receive the information you need. Instead of replacing your old curtains, sofas and armchairs with new, you can have them professionally cleaned. 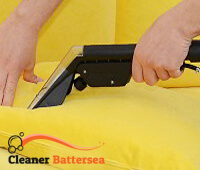 We can provide the upholstery cleaning which you need in your domestic and business property, located in Battersea, SW11 or somewhere nearby. All of our employees are trained and know how to provide excellent cleaning with long-lasting results. Let them restore the real colours of your upholstery and remove the blemishes, pet and smoke odours from them. We can guarantee you that you will be pleased with our cleaners’ work.